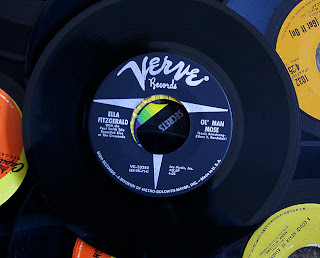 The other day I sat in a used book and record store with a friend of mine, and we sifted through stacks and stacks of used 7″ singles, curious to see what sort of gems we could walk away with. 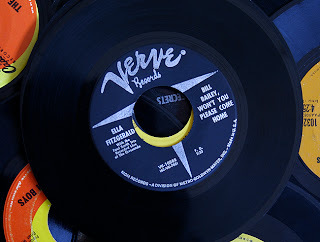 After spending what seemed like several hours looking through all of the records, like grubstakers panning for gold, I found this beautiful Ella Fitzgerald single with a Verve Records label, a label synonymous for producing incredible blues and jazz records. I didn’t even pay attention to the songs on the record, I just instinctively knew this record had to come home with me. Thankfully, I managed to find a few other Fitzgerald singles on this trip, which they too, found a new home. As I got home with my loot, the Fitzgerald single was one of the first records I played. Boy, did I hit music gold! The live renditions of the Louis Armstrong penned tune “Ol’ Man Mose” and “Bill Bailey, Won’t You Please Come Home” sounded absolutely amazing. Never had I heard such sounds come from my speakers. Fitzgerald belts these tunes with such austere authority that it is evident she was born to sing these songs, and exudes an all-time level of confidence during the peak of her career. 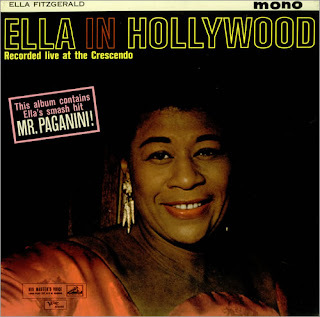 What makes this 7″ single special is that the two songs contained herein did not appear on the original “Ella In Hollywood” release, which has been out of print now for some time. The single gave the fans and audience just a small additional taste of those live recordings. However, the ‘fake’ concert hall audience is not present on the single, and turned up at full volume, makes you feel like you are right there in the smoky club sitting next to Glen Miller and Duke Ellington, who were spotted on occasion in the crowd during these live performances. Even though the “Twelve Nights In Hollywood” CD box set includes the two numbers from the 7″ single, both versions are completely different from one another, making the vinyl single that much more important in terms of hearing everything that has been officially released. The joy and sass Fitzgerald commands in these recordings, with the Paul Smith Trio setting the pace makes this some of the most exciting jazz my young ears have heard to date. Though I’m enjoying my run of replacing my CD collection with vinyl records where I can, the “Twelve Nights In Hollywood” box set is definitely worth investigating further, especially if just these two songs can command my attention as they have. Imagine what the rest of those recordings from The Crescendo have in store for my ears. Records like this make spending hours in a record store worth every single minute, as you never quite know what sort of musical treasure you will likely unearth. This entry was posted on Tuesday, June 14th, 2011 at 9:06 am	and is filed under Music, Uncategorized. You can follow any responses to this entry through the RSS 2.0 feed. You can skip to the end and leave a response. Pinging is currently not allowed. Damn. Wish I would have found some Ella. Great find.